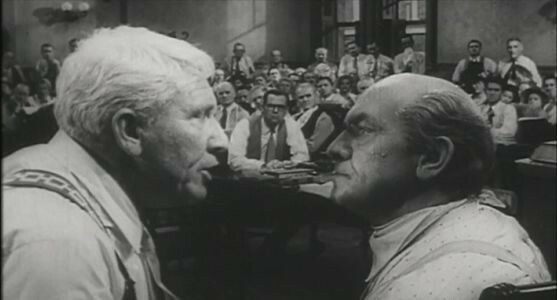 Akin: Evolution is "Not Even A Matter of Science"
Ever see Inherit the Wind, Todd? If you haven't, here's a spoiler: The politician who denies evolution gets so flustered trying to defend his position that he dies at the end. Todd Akin, Missouri's Republican Senate candidate, trained engineer, member of the U.S. House of Representatives' Committee on Science, Space and Technology and self-appointed expert on female reproductive issues has taken upon himself another role: Challenger of the dubious theory of evolution! At a Tea Party meeting yesterday in Jefferson City, Akin assured his audience that evolution is more or less bunk. I've taken a look at both sides of the thing, and it seems to me that evolution takes a tremendous amount of faith, to have all of a sudden all the different things that have to be lined up to create something as sophisticated as life. It takes a lot of faith. I don't see it as even a matter of science because I don't know that you can prove one or the other. We can talk about theology and all kinds of science things, but I'm basically concerned about, you've got a choice between Claire McCaskill and myself. My job is to make the thing there. If we want to do theoretical stuff, we can do that, but I think I better stay on topic. And also, this man has a background in science?